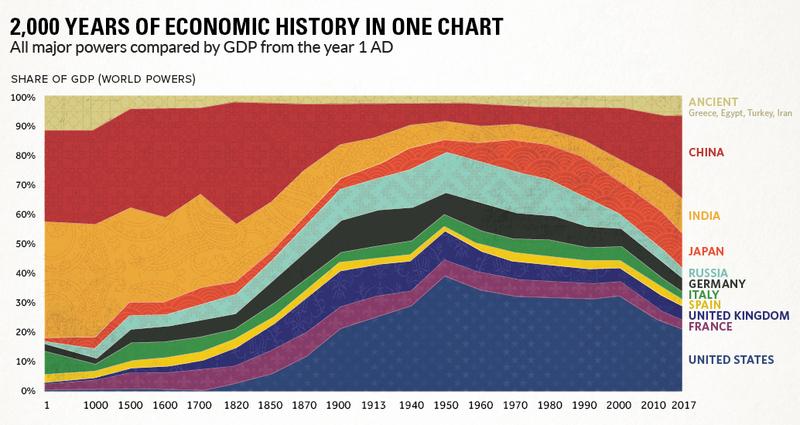 If we could point to one aspect that makes the modern era different from centuries past, the premier candidate for that distinction is how the centuries-established exponential, accelerating trend of technological progress manifests in economics, and the fact that the trendline is now in a steep upward trajectory. These are all worldwide metrics, and have to be. But if one examines the components, the variance contained therein is immense. One table that I use relatively often is the one that depicts relative GDP gain by country, and have in the past used it to describe how the 2008-09 crisis led to the rebound happening elsewhere. Google has just updated its economic data engine for 2017, enabling a full decade to be included from the start of the prior crisis. This enables us to see what happens when the global economy experiences a major dislocation. The Great Depression (1929-39) was one such dislocaton, and while the trendline is too steep today for a downturn of similar duration to manifest in the global economy, the more recent dislocation was almost as dramatic in terms of how it reoriented the tectonic plates of the global economy. From the table, we see that the World Economy grew by 40% in Nominal GDP. We do not adjust for inflation in these metrics for reasons detailed in the ATOM publication, and we take the US$ metric as universal. The US, remarkably, did not grow at a much slower rate than the world average, and hence has not yet experienced a substantial proportional shrinkage. By contrast, the rest of the advanced world has scarcely grown at all, while European economies have outright shrunk. An advanced country, of course, does not have the same set of factors to contend with as an emerging economy that is at a stage where high growth is easier, hence this is really two tables in one. India's underperformance relative to China is just as substandard as the UK's underperformance relative to the US. China has effectively dominated the entire world's growth. China has grown at an astounding 245%, partly due to a structural strengthening of its currency, which itself is partly due to their more advanced understanding of technological deflation and the monetization of such through their central bank (as per the ATOM concepts). India has not experienced any such strengthening of its currency (quite the opposite, in fact), which is why India's economy has grown at a far slower rate despite starting from a very low base. Consider this other chart, of GDP distribution by country (as per the current borders) from the year 1 until 2017. The growth of China (and to a lesser extent, India) appears to be a reversion to a status quo that existed from the dawn of civilization all the way until the early 19th century. If this factor is combined with the exponential trend of world growth, then China's current outperformance seems less like an aberration. This begs the question of what the next decade will look like. There is almost no chance that China can outperform the RoW by the same magnitude from this point onwards, simply due to the RoW no longer being large enough to manage the same intake of Chinese exports relative to China's size as before. But will the convergence take the form of China slowing down or the RoW speeding up? Will India experience the same convergence to pre-19th century proportional size, or is India a lost cause? Under the ATOM program, it could certainly be the latter, since the advanced economies already have enough technological deflation that they can monetize it through central bank monetary creation. China, by contrast, will not be technologically dense enough for it until 2024 or so. The US could rise to 5-6%/year Real GDP growth by 2025. The current mindset in the Economics profession is vastly outdated, and there is little to no curiosity about accelerating economic growth rates, or about the relationship between technological deflation and central bank monetary action. If China can no longer be an outlet to accommodate the entirety of the trendline reversion force that is seeking to work around these obstructions, then explosive growth combined with chaotic disruption will happen somewhere else.